What And Where is “Heaven”?.. God never had any intention of always maintaining a heaven somewhere 'up there', quite separate from earth. Part IV B... No More Sea? Part VI... Will There Be Time and Space In The New Earth? See An Overview of Revelation. However, these verses are not definitive proof of the total obliteration of the earth, simply because both the Hebrew and Greek words used (Heb. châdâsh and Gk. kainos) do not necessarily mean something that has recently come into being, but can also mean something fresh or rejuvenated. For example, in the following verses, the Lord's kindness is renewed every morning as the psalmist said (a), and people's heart's are renewed or refreshed, not replaced (b). Also note some examples of how the Greek kainos is used in the New Testament. In fact, it has been rendered "fresh" by the NASB in the first example. reads "Then I saw a great white throne and Him who sat upon it, from whose presence earth and heaven fled away, and no place was found for them", which some take to indicate that the old heaven and earth no longer exist. However, the word translated "fled" means 'ran away'. Therefore, saying the earth and heaven "fled" before God is dramatization. Revelation 20:11 is not meant to be taken literally but, like many verses in the Psalms, paints a picture of God's majesty so overwhelming that even the planets cannot stand before Him. (Perhaps we need to pay attention to the fact that if the heavens and earth 'flee' at the sight of the Father as judge on His white throne, we had better stop taking our religion as lightly as many of us do, and do everything possible to ensure that we do not find ourselves standing at the foot of that throne). One prophet of old told us what the end of the age will be like. *The word “things” is not in the original Hebrew. Finally we have Peter's second letter which seems to, unambiguously, point towards the heavens and the earth being totally burned up by fire. Or does it? For: In this chapter, Peter talks about those who will, in the last days, scoff at the idea of the Lord's return saying that nothing has changed since the beginning of creation and that the world will last forever. He exhorts his readers to remember that God destroyed the world one before and it will happen again. He will come and judge the world as he promised. However, time is not the same to God as it is to us, and He is being patient not wanting any to perish. The day of the Lord will come like a thief and, when it does, the heavens will pass away with a roar, the elements will be destroyed with intense heat, and the earth and its works will be burned up. Additionally, the word 'earth' has been translated from the Greek ge, which can mean a region as in Matthew 2:20 (take the Child and "go into the land (Gk. ge) of Israel"). However, in this context, ge has to refer to the physical earth, as in not one sparrow will "fall to the ground (Gk. ge) apart from your Father" (Matthew 10:29). Note that Peter uses the Greek word ouranoi, (translated heavens) which is plural (http://biblehub.com/interlinear/2_peter/3.htm). As we saw in chapter 1, the word heaven can refer to 1) The visible sky, where birds fly, and clouds float, 2) Outer space where planets and stars etc. exist, or 3) The far less tangible place where God Himself dwells and which Jesus called the "Father's house" John 14:2. Since, God isn't going to demolish His own dwelling place, destruction is limited to the first two.... the atmosphere and outer space. In his first book, Peter compares the process of refining gold by fire (ie. melting it and extracting any other metals present) with how faith is refined by adversity and tests. All that is left at the end of the process is pure undiluted gold, while faith emerges stronger. Therefore it is entirely possible that Peter is using the earth and heavens being burned up with fire as symbolism for a "smelting process from which the world will emerge purified". It is a moral, not necessarily a physical, burning up. That this may have been what Peter had in mind may be seen from his use of the word kainos, twice used in verse 13... a new (Gk. kainos) heavens and a new (Gk. kainos) earth. As previously mentioned, kainos can, and often does, mean remaking, refreshing and renewing in the New Testament. In other words, Peter's words may very well not refer to the physical destruction of the world, but to its purification. The earth will not be destroyed, but will be restored to the state it was in when God called it "good". Remember that the seven bowls are the culmination of God's wrath. The Tribulation (the persecution of the church), is followed by The Great Tribulation, which is God's wrath being poured out on the earth in the form of seven plagues (See The Seven Seals and Matthew 24). This is such a terrible time, that, as Jesus said, if "those days" had not been shortened, "no flesh would have been saved, but for the elect's sake those days shall be shortened". There have to be some believers left who Jesus then takes off the face of the earth at the sounding of the Seventh Trumpet, and just before the Seven Bowls rain down. It is after this that believers, who 'met' Christ in the air, will return with Him to this earth along with the angels. (See The Rapture) However, the prophet Zechariah was very clear as to exactly where on earth Jesus would first set down. It is from the Mount of Olives that Jesus will, once again, enter Jerusalem through the Golden Gate, this time as its King. Please note that, in fulfillment of a prophecy made by Ezekiel (44:1-2), this gate, and only this gate, which is one of many in the walls of Jerusalem, was sealed off in 1541 by Suleiman the Magnificent, the tenth and longest-reigning 16th century Sultan of the Ottoman Empire. See The Golden Gate on THIS page. The point is that if the prophecy is to be fulfilled, the Mount of Olives, the Golden Gate and the city of Jerusalem itself have to exist when Jesus returns to earth. This in no way disagrees with Zephaniah who said the Lord would make a complete, and terrifying end of all the inhabitants of the earth. Unlike much of the book of Revelation, chapter 20 through (at least) 21:5 seem to be in chronological order, indicated by the frequent use of the word "then". (1) Then I saw an angel coming down from heaven, holding the key of the abyss and a great chain in his hand. (2) And he laid hold of the dragon, the serpent of old, who is the devil and Satan, and bound him for a thousand years; (3) and he threw him into the abyss, and shut it and sealed it over him, so that he would not deceive the nations any longer, until the thousand years were completed; after these things he must be released for a short time. (4) Then I saw thrones, and they sat on them, and judgment was given to them. And I saw the souls of those who had been beheaded because of their testimony of Jesus and because of the word of God, and those who had not worshiped the beast or his image, and had not received the mark on their forehead and on their hand; and they came to life and reigned with Christ for a thousand years. (5) The rest of the dead did not come to life until the thousand years were completed. This is the first resurrection. (6) Blessed and holy is the one who has a part in the first resurrection; over these the second death has no power, but they will be priests of God and of Christ and will reign with Him for a thousand years. (7) When the thousand years are completed, Satan will be released from his prison, (8) and will come out to deceive the nations which are in the four corners of the earth, Gog and Magog, to gather them together for the war; the number of them is like the sand of the seashore. (9) And they came up on the broad plain of the earth and surrounded the camp of the saints and the beloved city, and fire came down from heaven and devoured them. (10) And the devil who deceived them was thrown into the lake of fire and brimstone, where the beast and the false prophet are also; and they will be tormented day and night forever and ever. In Summary, an angel lays hold of Satan (the serpent of old), throws him into the abyss, which the angel shuts and seals for a thousand years (20:1-3). John then saw those who had not worshiped the beast, but were beheaded for the gospel, come to life and reign with Christ for the thousand years (20:4-6). When these years are up, Satan will be released from his prison, and will go out to deceive the nations, gathering Gog and Magog from the four corners of the earth (20:7-8). These people will besiege Jerusalem, but will be consumed by fire from heaven (20:9). John then outlines the fate of the devil, the beast, and the false prophet who are to be "thrown into the lake of fire and brimstone" (20:10), describes God’s great white throne, at which the dead, small and great, stand before God, and are judged according to their work (20:11-13).John then tells us that death and Hades will also be “thrown into the lake of fire” (20:14). God not only renews/remakes the heavens and the earth, but brings His capitol city, Jerusalem, down from Heaven to earth. 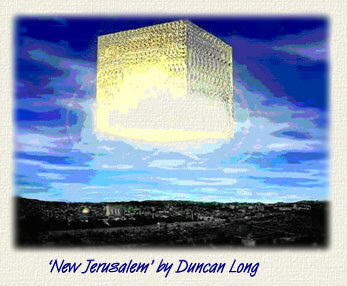 It is from this New Jerusalem that He will rule and rejoice. Incidentally, it is sometimes claimed that the New Jerusalem will not actually land on earth, but will remain suspended in the air, which stems from the idea that Heaven and Earth must always be separate... one being holy, and the other far from it. However, when John watches the city "coming down" from Heaven, there is nothing that indicates it stops before actually touching down. God never had any intention of always maintaining a heaven somewhere 'up there', quite separate from earth. Modern day charlatans please note that, with the exception of Paul's rather enigmatic account in his second letter to the Corinthians (12:2-4) , there is NO record of anyone ever, visiting, or being taken up to God's throne room. And no, Elijah wasn't either. See Did Elijah and/or Enoch Ascend to Heaven? See Did Elijah and/or Enoch Ascend to Heaven? Adam and Eve were never taken up to God's dwelling place to visit Him. Instead Genesis 3:8 tells us that God Himself, walked the garden in the cool of the day. Much to the contrary, the Bible shows that not only did God visit earth, but the Tabernacle was built as God's "dwelling place", one that He intended to live in forever. On Mount Sinai, God gave Moses specific instructions as to how the tabernacle was to be built. Exodus 40 tells us that, when Moses was finished, the "glory of the Lord filled the tabernacle". In the Gospel of John the Lord Jesus Christ is introduced as the Son of God who dwelt among men. And, as shown earlier, the kingdom of God and the heaven Christians look forward to, are synonymous. The kingdom, defined as God's authority and rule, has already been established itself on earth in the hearts of men. It arrived with Jesus' preaching of the Gospel of the Kingdom, and secured itself within the disciples, who were the initial 'subjects' of the kingdom. It made huge strides among the Jewish community at Pentecost, then was taken to the Gentiles and spread throughout the known world. However, its final fulfillment (which is around the corner), will take place when Jesus makes His glorious return to establish His physical rule on earth. See The Kingdom... When? And we will have heaven at last. Which leaves us with one question... whether or not the oceans will exist as part of this new earth. "Artwork © by Duncan Long. Used with permission. All rights reserved"